What is a Nonstress Test and Why is it Performed During Pregnancy? Prenatal visits are absolutely essential throughout pregnancy, as they allow constant monitoring and care for your unborn baby. Such consultations involve a routine physical examination with your midwife or obstetrician. In most cases, you may be requested to undergo several prenatal tests, including a nonstress test, which may also be referred to as fetal heart rate monitoring. A nonstress test is a common prenatal test that allows you to further check on the baby’s health. This test generally monitors the baby’s heart rate in response to its movements. Pregnant mothers often need nothing to worry about since as the name suggests, no stress is placed on the fetus while the test is performed. By monitoring the baby’s heart rate and how it responds during movement, the healthcare team is able to gather essential information regarding his or her oxygen supply. Just like an adult’s, the baby’s heart rate normally beats faster during activity, especially later in pregnancy. The test will monitory heart rate variability in response to fetal movement. Otherwise, the baby could be experiencing fetal hypoxia—a condition where he or she does not get adequate oxygen. With a nonstress test, your doctor will be able to decide whether there is a need to do further monitoring, testing, or intervention to prevent fetal death. Not all pregnant women may be required to undergo a nonstress test, but your doctor may suggest it if you have certain complications throughout your pregnancy, such as gestational diabetes, heart disease, or preeclampsia, or a postdate pregnancy. A nonstress test can also be recommended if you have had an amniocentesis or if you are diagnosed with low amniotic fluid. Your baby needs to be at a certain weight depending on his or her gestational age, but if the baby measures small and isn’t very active, then a nonstress test may be performed. It is also performed when you are past your due date, yet you haven’t gone into labor. Usually, the test is done during your third trimester of pregnancy, which is from week 28 onwards. 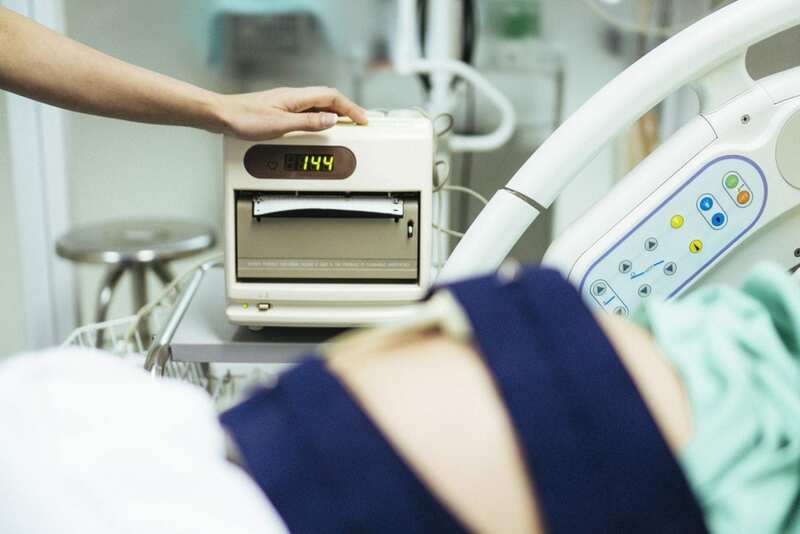 During a nonstress test, belts are strapped across the mother’s abdomen and connected to two different types of transducers—the Doppler to measure the baby’s heart rate and the toco transducer to measure the contractions. Toco transducers work by measuring the relative rate, strength, and duration of uterine contractions. These are the same fetal monitors you will likely be hooked to during labor if you are planning a hospital birth. The entire test measures the heart rate, movement, and reactivity of the fetal heart rate to movement, and will go on for about 20 to 30 minutes. In case the baby does not move, it does not immediately indicate a problem as he or she could just be asleep. During this time, a nurse or your healthcare provider may use a small “buzzer” to alert the baby while the test is performed. You may also be encouraged to drink some juice or eat something sugary to prompt baby to move and get excited! A reactive nonstress test result occurs when the baby’s heart rate rises normally during movement, which means that the baby is receiving adequate oxygen and blood flow. Meanwhile, a non-reactive result means that the baby’s heart rate did not increase enough during a minimum number of movements within a 40-minute period, which may require further observation and more tests to further check on your baby’s health such as a biophysical profile or a contraction stress test. In more serious cases, your doctor may recommend labor induction and early delivery, especially in the case of a non-reactive result during week 39 or a full term pregnancy. A nonstress test may be something you have not heard of until today. Make it a point to be on top of your prenatal consultations by discussing prenatal tests in depth and what they might mean for you and your little one! Mandy Johnson specializes in Prenatal Care. She has been in the medical field for 8 years now. Aside from having patients, she also enjoys writing medical articles that helps people to easily understand the nature of her job.